Ever have one of those ideas that seemed great in your head only to end up being a huge disappointment once implemented? The Tampa Bay Rays had one of those last night for the home opener. We have seen this implemented in numerous other stadiums using their respective team’s logo. The most memorable is the use of the Red Sox logo often used on the infield at Fenway Park. The problem with the use of the Sunburst logo at The Trop, is that the logo doesn’t look right in a color other than something resembling “sunlight” colors. In fact, in dark green it either looks like a gigantic “splat” of discolored turf or a giant sinkhole threatening to swallow BJ Upton. Maybe it would look better if it was on grass and not on the shiny FieldTurf2. Or maybe it would look better if it was bigger. But as it is…it just looks stupid. And trying to replicate the artistic grass cutting seen in other parks on plastic carpet is yet another reason why it is a little silly that a team playing in a DOME has sunlight for a mascot. 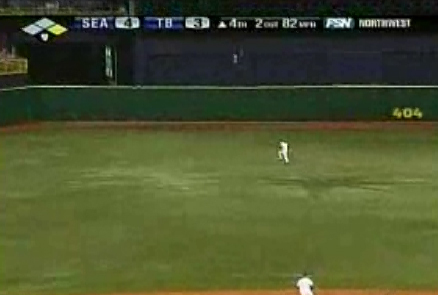 Just when the rays look like they might turn the corner and become credible, someone puts a pee stain in the outfield. Good times good times. we laugh because it's funny, we laugh because it's true. I think it's a fine idea to have a "faux-mowed" logo, but they really should have used the "TB" logo found on the caps, something that actually looks like it was put there on purpose. That SPLAT is ridiculous, hahaha. agreed. The TB would have looked a hell of a lot better. If I were watching the game, either I wouldnt have noticed this or I would have thought something was wrong with the carpet. as it is, it took me a second to figure out what you were talking about in that picture.